The trouble with security software is that it's always racing to catch up with new viruses and malware. They typically check against a database of known issues to protect you, which isn't very useful for brand spanking new attacks. Qualcomm is trying to fix that with its Smart Protect technology, which uses machine learning to keep an eye out for potential security issues in real time. Instead of relying on a static list of threats to protect you, it'll actually watch out for suspicious app behavior. Smart Protect will debut on Qualcomm's upcoming Snapdragon 820 mobile processor, details of which it's slowly leaking out. We already know the Snapdragon 820 will have faster graphics capabilities, for example, making it ideal for VR solutions. Naturally, Qualcomm is also offering an API for the new Smart Protect feature, allowing security software companies to take advantage of the new chip's heightened awareness. 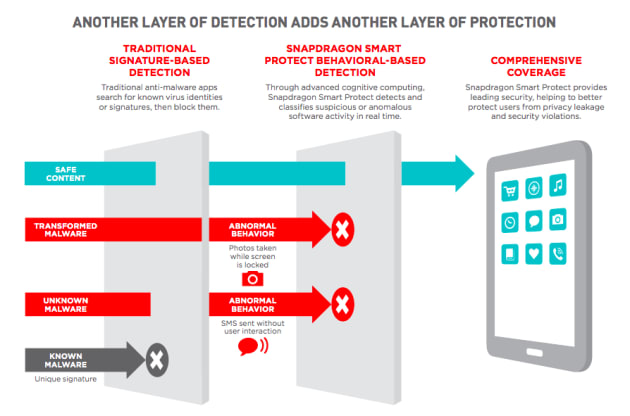 "Snapdragon Smart Protect is engineered to look at the actual behavior of device applications in real time and almost instantly detect and classify any application behavior that is considered suspicious or anomalous," Qualcomm wrote in a blog post. "Suspicious applications are classified into severity levels of malware, ranging from more destructive malware applications, to spyware apps, to less threatening though annoying adware apps." By making Smart Protect a feature right on Qualcomm's new hardware, it will also be able to keep your device secure without an internet connection. The big takeaway here: Malware protection on mobile devices is getting even more sophisticated than desktop security software, which, for the most part, still relies on downloading new antivirus and malware definitions to keep you safe.